The forum was organized by the Arab Water Council in Cairo, Egypt, and was attended by ministers of water and agriculture from various Arab countries and regional and international organizations, as well as a large number of key people in the water sector throughout the MENA region. The three-day forum addressed a host of themes, such as plans for tackling water shortage, optimum utilization of water resources and states' negotiations on water sharing. 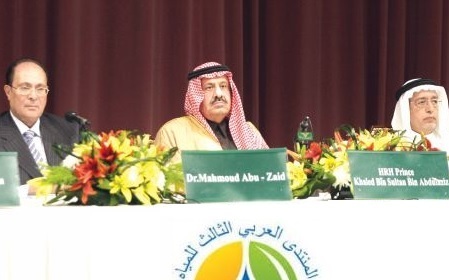 In his opening speech, HRH Prince Khalid made clear that the implementation of "a secure water future for Arab countries " requires that Arab countries have a certain degree of political unity, economic agreement and social consensus so as not to let their varying national interests dissipate their collective efforts. He pointed out that the failure or inability to ensure a minimum standard of Arab water security threatens the political and social stability of all Arab countries. The chairperson of the forum's organizing committee, Dr. Safwat Abdel Dayem, described Prince Khaled as the founder of "water diplomacy" in the Arab region, through which he first sounded the alarm of the threat posed by a lack of regional water security. He added that Prince Khaled warned early on that most Arab countries are "estuary countries" and therefore rely on neighboring countries upstream for most of their water needs, which represents a real threat to the future of these resources. He then added that Prince Khaled supports the Arab Water Council's efforts to establish specialized centers to build capacity and expertise, such as the Arab Water Academy newly established in Abu Dhabi and the upcoming Institute of Water Studies in Casablanca. Both centers seek to develop expertise at the highest level and bring about the consolidation of water policy by negotiating both physical science and legal studies to define and optimize Arab water resources and regional water rights. He concluded by saying that long before the establishment of the Arab Water Council, Prince Khaled bin Sultan bin Abdulaziz was active in the area of water diplomacy, not only in the Arab world, but with the broader international community, in addition to his efforts with the Prince Sultan bin Abdul Aziz International Prize for Water, a global award judged by the international water community that awards innovation in water science. The Arab Water Forum is the largest and most important event organized by the Arab Water Council. Water professionals, experts, water service providers, decision makers and politicians gather together in the presence of representatives of development agencies, industries, NGOs and civil society, including women and youth, to deliberate on the state of water in the region and the challenges to be tackled to secure the regions future water needs for growth and sustainable development. Water remains the most precious substance in the Middle East and North Africa, where extreme aridity dominates the life of more than 300 million people in 22 Arab countries. Water scarcity is worsening due to population growth and the effects of climate change.